There are not many eye creams with SPF. Eye creams with SPF tend to irritate the eyes. The following ones won’t. These eye creams will protect and benefit your delicate eye areas. Of course, using eye creams is not a must so you can simply use sunscreens for sensitive skin if you prefer. From my experience, those are actually less likely to crease. Clarins Sun Eye Contour Care Ultra Protection SPF 30, Wrinkle Control has titanium dioxide as its only sunscreen ingredient, which does not irritate the eyes. Clarins skin-care products are known to have a lot of fragrance, as is expected from a French line :). But surprisingly this eye cream is fragrance free, which is just right for the skin around the eyes. Clarins claims that this eye cream contains Phyto-Sunactyl 2 Complex (extracts of Senna, Olive, Pea, Plane Tree and Baobab). The amounts of these extracts are not impressive. Nevertheless, the sun protection this eye cream provides is beneficial. Lancome Bienfait Multi-Vital Eye SPF 28 has about 7.5% octinoxate and about 5% titanium dioxide as its sunscreen ingredients. Octinoxate is not a “mineral” sunscreen but it does not string eyes. Lancome Bienfait Multi-Vital Eye SPF 28 includes some silicones, which help the sunscreens spread. It contains small amounts of good-for-skin ingredients such as black currant seed oil, vitamin E and caffeine. It also has compounds of magnesium, zinc and copper, which may be anti-inflammatory and help build collagen, but the concentrations are very low. This eye cream sunscreen is fragrance free. Please find the full ingredient list and explanations of Lancome Bienfait Multi-Vital Eye SPF 28 at the end of this post. 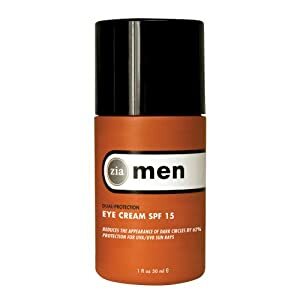 Zia Men’s DualProtection Eye Crème SPF 15 has 5% octinoxate (the name Ethylhexyl Methoxycinnamate is used on the package) and 4.7% zinc oxide. It is fragrance and paraben free. It contains some soothing extracts and smaller amount of vitamin E and peptides. The formula is suitable for women too although the bottle looks manly. The only consideration for women is that women’s eye cream is usually designed to work well with eye makeup while men’s eye cream does not have to. So I would recommend this to anyone (men or women) with minimal makeup. 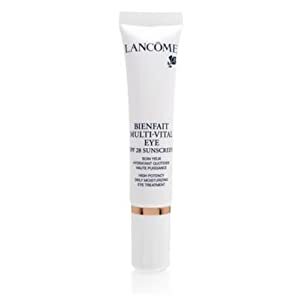 Lancome Bienfait Multi-Vital Eye SPF 28 Ingredients: Active ingredients: Octinoxate (about 7.5%), Titanium Dioxide (about 5%); Other ingredients: Water, C12-15 alkyl benzoate (emollient often used in sunscreens), Isononyl Isononanoate (skin-conditioning ester), Nylon-12 (absorbent), Cyclopentasiloxane (silicone), Glycerin (moisturizer), Propylene Glycol (humidifying solvent), Methylsilanol/silicate crosspolymer (emulsifier), Polymethylsilsesquioxane (polymer formed from silicone, which can function as a slip agent), Cetyl PEG/PPG-10/1 dimethicone (silicone), PEG-30 dipolyhydroxystearate (emulsifier), Synthetic wax (emollient), Polyglyceryl-4 isostearate (emulsifier), Dimethicone (silicone), Caprylic/capric triglyceride (extract derived from coconut, emollient), Sodium chloride (binding agent), Ribes nigrum (black currant) seed oil (may promote healthy skin growth), Mica (pigment), Tocopheryl acetate (vitamin E), Stearalkonium hectorite (suspending agent), Caffeine (antioxidant), Magnesium sulfate (emulsifier), Magnesium aspartate (generally in supplement, no special effects found on skin), Polyhydroxystearic acid (suspending agent), Helianthus annuus (sunflower) seed oil (emollient oil), Polycaprolactone (emollient), Dimethiconol (silicone), Panthenol (moisturizer), Zinc gluconate (anti-inflammatory), Propylene carbonate (solvent), Copper gluconate (may help skin build collagen), Moringa pterygosperma seed extract (emollient), Disodium EDTA (preservative), Castanea sativa (chestnut) seed extract (astringent and drying), Rosa canina fruit oil (rose hip oil, emollient oil that has antioxidant properties), Cetearyl Alcohol (emollient, emulsifier and thickener, can be comedogenic), Potassium cetyl phosphate (surfactant), Aluminum tristearate (thickener and stabilizer), Alumina (thickener and absorbent), Diazolidinyl urea (preservative), Phenoxyethanol (preservative), Ethylparaben (preservative), Methylparaben (preservative). I have been using Clarins Sun Eye Contour SPF 30 for years now (probably since the product first came out in the market). I believe it is an excellent product as it never irritated my under eye skin. I even tried it to my partner as other mild face products with spf irritated his eyes. Clarins did not. PS. please do not share my email. Thank you! There are no publications about this. I did tests on my own eyes. I found that oxybenzone (aka benzophenone-3) and ecamsule (aka Mexoryl SX) irritated eyes, with ecamsule being much less irritating. The irritation is stronger when the concentrations of these ingredients are higher. In addition, if your sunscreen is more water-resistant, these ingredients less easily get into your eyes. That way, it is also less likely to cause eye irritations. What sunscreen ingredients sting the eyes?